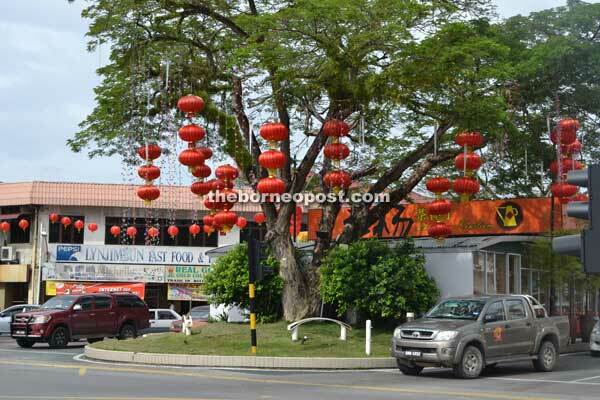 Jalan High Street and Jalan Kingsway in Miri is seen with hundreds of red lanterns hanging from the trees along the stretch. MIRI: The city is gearing up to welcome the Chinese New Year with colourful decorations and setting up of stalls at the annual Gong Xi Fa Cai Bazaar. As usual, the whole stretch of Jalan High Street and Jalan Kingsway here was seen with hundreds of red lanterns in various sizes hanging from trees, adding a touch of the Oriental to the resort city. Meanwhile, a retailer known for selling a variety of Chinese ornaments has already begun its business ahead of others. Apart from these, several parking bays in front of the Miri Resident Office will be reserved to give way for the construction of a huge stage, in conjunction with the bazaar. To avoid traffic congestion, members of the public are advised to park their vehicles at designated places like the multi-storey car park. The multi-storey car park will be open free to the public from Jan 24 to 28 from 6pm until 12pm, and on Jan 29, it will be free parking for the whole day. This year’s bazaar is expecting 260 stalls consisting of hawkers selling halal and non-halal food, ornaments and accessories, clothes, cakes and snacks. The bazaar, a joint effort of Miri Chinese Chamber of Commerce and Industry (MCCCI) and Miri City Council, will commence on Jan 24 followed by an official ceremony to mark the annual event on the first day. Assistant Minister of Communication Datuk Lee Kim Shin has been invited to officiate at the event at 8pm.